Grapefruit essential oil for weight loss is a researched way to increase your chances of success, plus it has other benefits beyond what you see on the scale. Know that you cannot rely on it as a sole method to lose weight, but rather as a supplemental one along with other sensible ideas. As a plus, it is wonderful as an air freshener and deodorizer and smells refreshing and uplifting! Find out how you can use it for losing weight and for reaping other health benefits. Grapefruit, or Citrus X paradisi, is a subtropical fruit in the Rutaceae family. The “X” shows that it is a citrus hybrid between sweet orange and pomelo. When found, it was nicknamed the "forbidden fruit". The grape part of the name refers to the clusters of fruit on the tree that often appear similar to grape clusters. The segmented interior flesh can vary in color from white to yellow to red to pink. Grapefruit essential oil for weight loss and other health benefits is obtained through cold-pressing of the rind. Since the essential oil (EO) is in the rind, beware of articles online that use studies based on grapefruit juice or pulp, such as those touting that the EO is high in vitamin C. It is not. Since grapefruits may be treated with fungicides, pesticides and other chemicals, and grapefruit essential oil may be adulterated or contaminated, only purchase quality essential oils. Like many citrus, the volatile portion of grapefruit EO is high in d-limonene, an excellent antioxidant, anti-inflammatory, and anticarcinogenic (anti-cancer) compound. Because it is high in d-Limonene, care should be taken to store it in a cool, dark place to delay oxidation of the oil. I store mine in the refrigerator. Grapefruit EO has non-volatile components that can cause sun sensitivity when the oil is used topically. Exposure to the sun may cause inflammation, redness, and swelling of the skin that is similar to a sunburn, and chronic skin inflammation may be associated with skin cancer. Skin must not be exposed to sunlight or sun bed for 12 hours, particularly if the maximum of 4% dilution concentration is exceeded. Grapefruit EO has GRAS (generally recognized as safe) status in the US. Although grapefruit pulp and juice interact with many medications and hormone treatments via their effects on liver detoxification enzymes, the main constituents responsible for that ARE NOT in grapefruit essential oil. Bergamottin and bergapten, two of the most plentiful non-volatile compounds in the EO, albeit in tiny concentrations, inhibit CYP3A4, but their concentrations are believed to be too low in the oil to cause interactions. How Does Grapefruit Essential Oil for Weight Loss Work? Your body has two basic kinds of adipose tissue, or fat: white and brown, with beige as a third, in-between fat. White fat is the fat in which excess calories are stored. It acts as insulation, it cushions organs, it secretes hormones and chemical messengers, and it recently was discovered to be a reservoir for immune memory cells. Brown fat contributes to thermogenesis, the creation of heat through energy consumption. 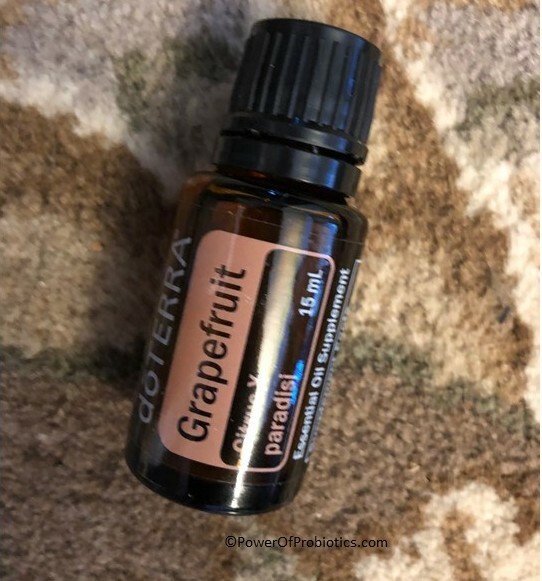 Inhalation of grapefruit essential oil for weight loss, either in a diffuser or directly from the bottle, works in at least two different ways. In the first way, it causes activation of the sympathetic nerve activity innervating white and brown adipose tissue, which helps with fat breakdown and suppression of body weight gain. Once broken down, the fat can be used for energy. The second way inhalation of grapefruit essential oil for weight loss works is by decreasing food intake. It does this by decreasing the activity of the gastric vagal nerve in rats and mice. The gastric vagal nerve is a section of the long, branching cranial (head) vagus nerve that runs from the brain down to the colon, with connections to organs, such as the lungs, heart, and most of the digestive tract in between the two. The gastric portion of the vagus controls things such as stomach emptying and stomach acid production. When the stomach does not empty as quickly as it usually would, the result is a feeling of fullness for longer, a decrease in appetite, and a decrease in food intake. Grapefruit EO has other beneficial properties, too, that will be covered in a future article. This study and this one show that the inhalation of the EO led to the desired results for weight loss as well as feelings of alertness and calm, so try adding a few drops to a diffuser. I like to combine it with a few other citrus oils such as orange, lemon, lime, bergamot, tangerine, red mandarin, and/or green mandarin and frankincense or ginger to make my house smell clean and invigorating. Make sure you are purchasing a quality essential oil. Remember that diffusing grapefruit EO is only one part of the weight loss puzzle. Your gut health, gut microbiome, eating habits, sleep habits, exercise routine and lifestyle also play important roles. If you'd like help with your weight loss plan, nutritional consultations can help. Grapefruit essential oil has many other beneficial properties for gut and overall health. Stay tuned for that information. Return to Essential Oils page.